Do you know what happens to your waste that goes down your toilet or drain? Well, you’ve come to the right place! Welcome to Septic Smart - Columbia Shuswap Regional District’s onsite septic system program. Here you’ll find all the information you need about household liquid waste and your septic system. Septic Smart Ambassadors visited residents in Anglemont, Gardom Lake, Malakwa, Sunnybrae, Swansea Point and White Lake in the the summer of 2016 to talk about healthy septic maintenance practices, deliver educational materials and complete a short survey. Thank you to all residents who participated. Two iPad mini 4’s were given away as prizes for participating in the survey. 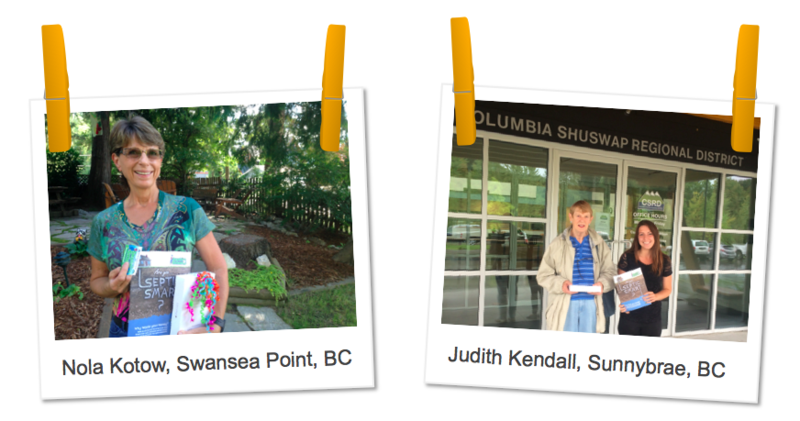 The winners are Nola Kotow of Swansea Point and Judith Kendall of Sunnybrae. To view the 2016 Septic Smart Survey reports, click here. Download our handy homeowner guide to get all the basic information you need to properly maintain your septic system and save money. Does your system need an inspection or pump out? How long has it been since your system was inspected? How has it been since it was pumped out? The CSRD recommends having a septic inspection every 3-5 years by a qualified professional. Visit the Onsite Wastewater Registered Professionals website and search for a ROWP to find a qualified professional near you. If you have a septic system and live in the CSRD, check out these resources to find everythng you need to know about household liquid waste and how to properly maintain your system. Do you know if your property has a septic system? Most homes in the CSRD do. Our handy homeowner guide is the place to start for all the basic information you need about your septic system, how to maintain it properly and save money. Buying a home in the CSRD? Knowing what is under the house is just as important as the house itself. Learn about what to look for regarding a septic system when buying or selling a new or used home.